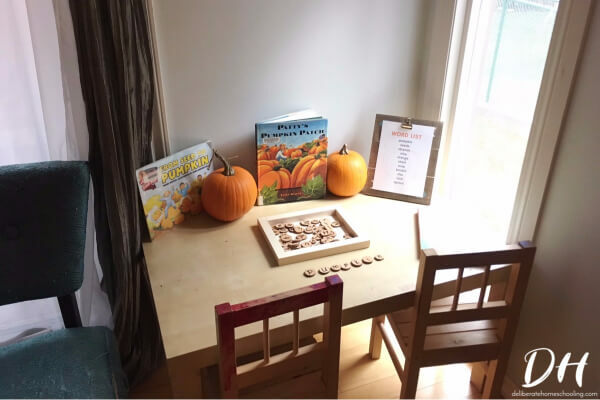 Set up a table with a few pumpkins for your child to explore. Display several books about pumpkins. Read: The Pumpkin by John Greenleaf Whittier. Discuss the poem. Display a pumpkin-related word list. 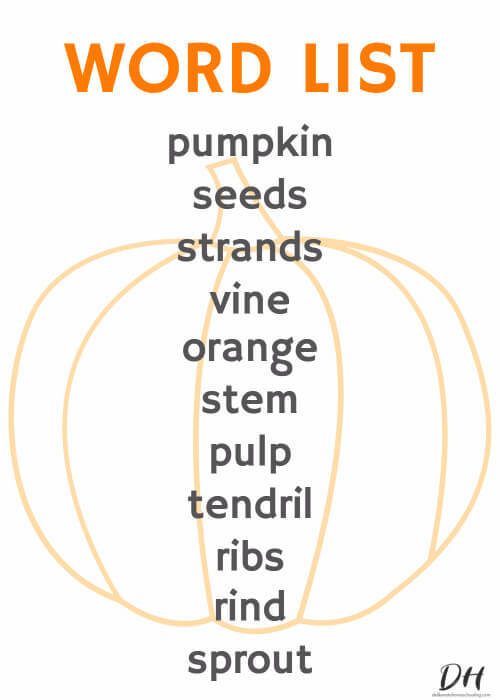 Some words to consider: pumpkin, seeds, leaves, vine, stem, pulp, skin, tendril, and strands. Practice writing the words from the pumpkin word list. Using the letters from the word “pumpkin”, make as many words as you can. Write an acrostic poem about pumpkins. Write a short story about a pumpkin. Plant pumpkin seeds. Observe how long it takes for them to sprout. Label this pumpkin life cycle chart. Cut open a pumpkin and investigate the inside! Make sure you have your magnifying glasses handy! Pumpkin decomposition. Let your pumpkin rot in your garden. Observe and take notes. (If you do this activity make sure to read the book Pumpkin Jack because it’s about a child who carves a pumpkin for Halloween and leaves it in the yard to decompose until spring. Complete this hundreds chart mystery picture (hint, it’s a pumpkin)! Sequencing with this set of pumpkin sequence cards. Weighing pumpkins. Estimate how much your pumpkin weighs, then use a scale to weigh the pumpkin. Whose guess was closest to the actual weight. Get out your measuring tape and measure the circumference of a pumpkin. Now measure the diameter (the distance across). Count the seeds inside a pumpkin. 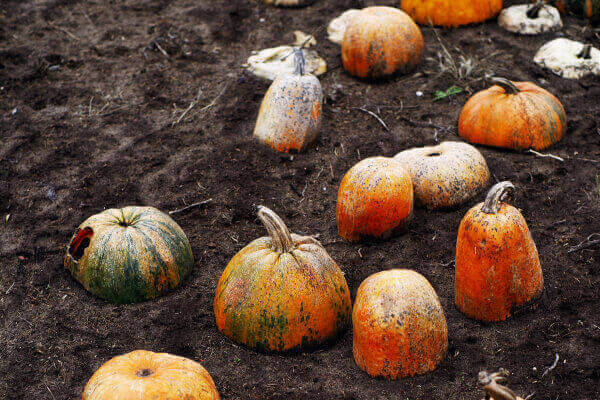 Visit a pumpkin patch. Speak with the farmers and workers who operate the pumpkin patch. Use the Internet and books to explore the history of pumpkins. Visit a grocery store and look at the pumpkins there. Get your children cooking! There are so many great pumpkin recipes available on the internet. If you’re not sure how to start cooking with your children, then check out this post HERE for some helpful tips and suggestions. There are also some fabulous pumpkin cookbooks. This particular cookbook is amazing (Nutella Swirled Pumpkin Muffins and Salted Caramel-Swirled Pumpkin Cheesecake Bars… need I say anything more?)! 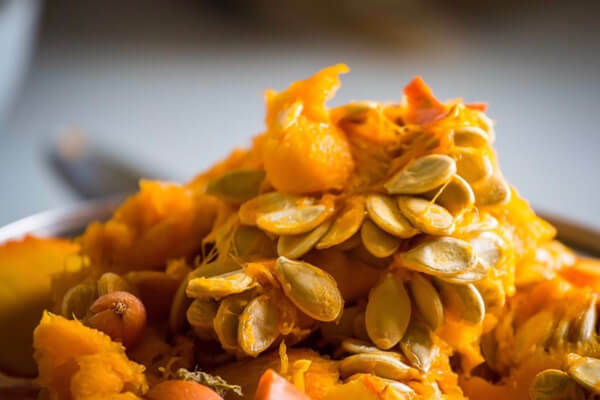 Roasted Pumpkin Seeds – Of course! 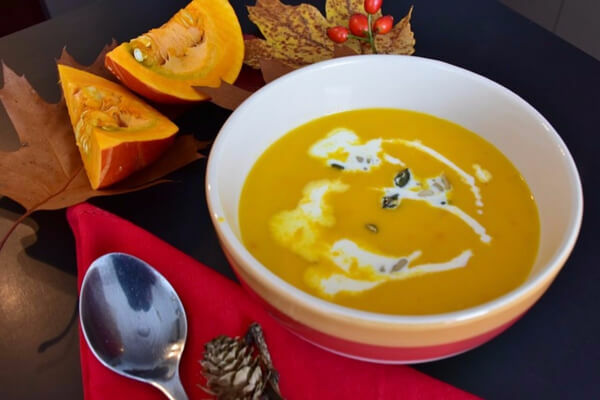 Creamy Roasted Pumpkin Soup – Even the sound of it warms my belly! Pumpkin Stew – It’s actually cooked in a pumpkin! How cool is that?! Pumpkin Pie – A necessity during pumpkin season! Vegan Pumpkin Pie Smoothie – Mmmmmm. Pumpkin Cookies with Cream Cheese Filling – Decadence! Someone hides the pumpkin and everyone else has to find it. 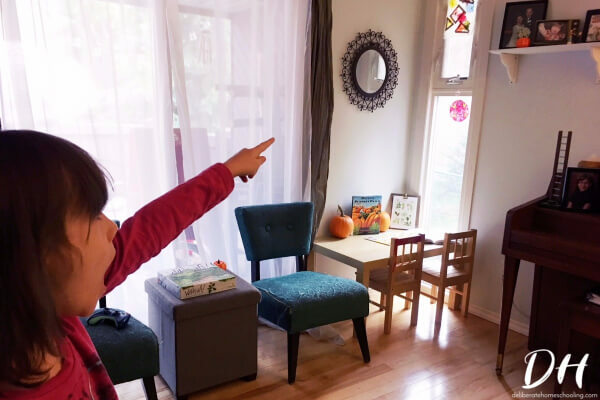 Hide pictures of pumpkins (or miniature pumpkins) around the house and have your children search for them. Like musical chairs. Play music. Pass a small decorative pumpkin from one person to the next. You don’t want to be the person holding the pumpkin when the music stops! The person caught holding the pumpkin is in charge of the music. *This activity is best with 4 or more people. Set up some small plastic bowling pins (or you can make your own out of empty pop bottles). Takes turns rolling a small pumpkin and try to knock down all the pins. Ask for your children’s thoughts and impressions. What do they think the sculpture is made of? What is the person doing? Look up the definition of Netsuke. Check on a ruler how big the actual sculpture/carving is. Ask your child what they think is happening in the picture? If they were to color this picture, what colours would they use, and where? Carving pumpkins! Make sure to draw your design first! This glue resist pumpkin art project is gorgeous! Little hands need adult help with this one, as a glue gun is required. Starlight Pumpkin Art is a fun one for children of all ages. Get out some paints and paint a pumpkin! This mini pumpkin art print activity is great for the youngest children, but older kids enjoy this too! Sketching pumpkins in our nature journals. Paint a picture of a pumpkin. Do the Pumpkin Chalk Pastel art lesson! 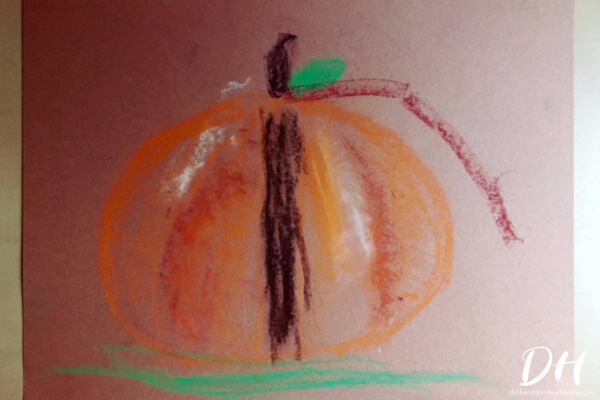 The pumpkin lesson is a free (found at the bottom of the Fall Video Art Lesson sales page). Have your child select a pumpkin and fill out this pumpkin investigation worksheet. Movie night! Watch It’s the Great Pumpkin Charlie Brown. If you wish to assemble your own unit study, simply write ideas from this post into your planning sheets. If you don’t have a homeschool planner, I encourage you to check out this planner. It’s very flexible and can be used with several children. 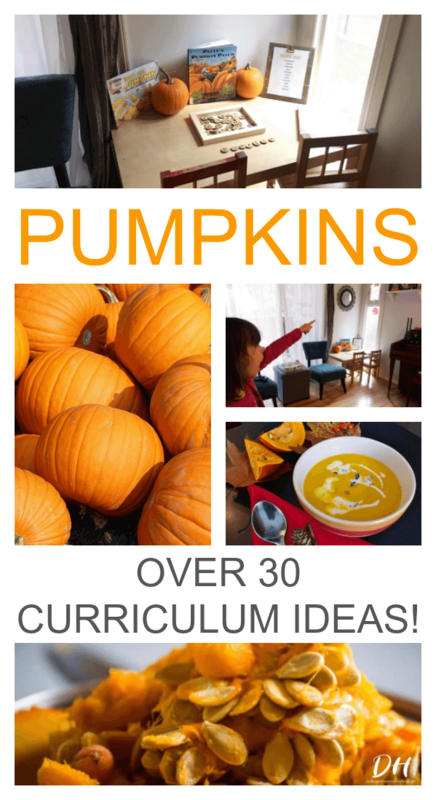 With this list of activities, I’m confident you can put together a fabulous pumpkin curriculum for your children.